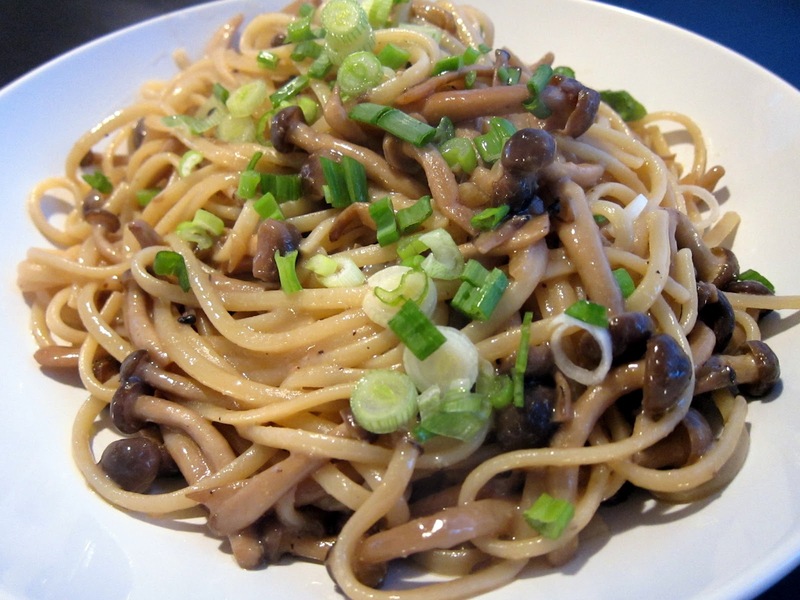 Linguine with Shimeji Mushrooms – Overworked. Underfed. This had got to be my most FAVORITE recipe discovery of the year, mostly because it’s so easy and doesn’t require a lot of extra ingredients that I wouldn’t normally already have laying around. Surprisingly, the dish is completely VEGETARIAN and still excites me. Just the other day it was “meatless Mondays” in the cafeteria and I was completely disappointed and struggled to find something good to eat. I ended up fishing out as much chicken in the chicken noodle soup, but I was thoroughly disgruntled with my polenta terrine and steamed zucchinis. 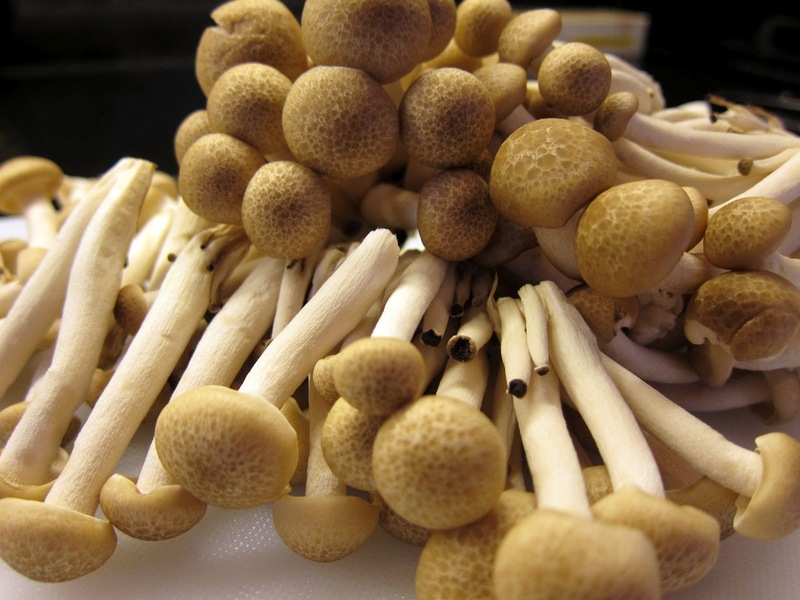 The key ingredient to this dish are shimeji mushrooms which are also known hon-shimeji, white beech, or brown beech mushrooms. At my supermarket they are sold prepackaged in 3-4oz portions. I don’t do much to them but cut off the roots so they can separate. I don’t even wash them because they’re mushrooms and I think they’ll just soak up all that excess water, which you don’t want. You sautee them up in a decent amount of olive oil and garlic. I cut back the amount of oil from what the original recipe calls for, but you do want a good amount because the oil helps create a sauce. 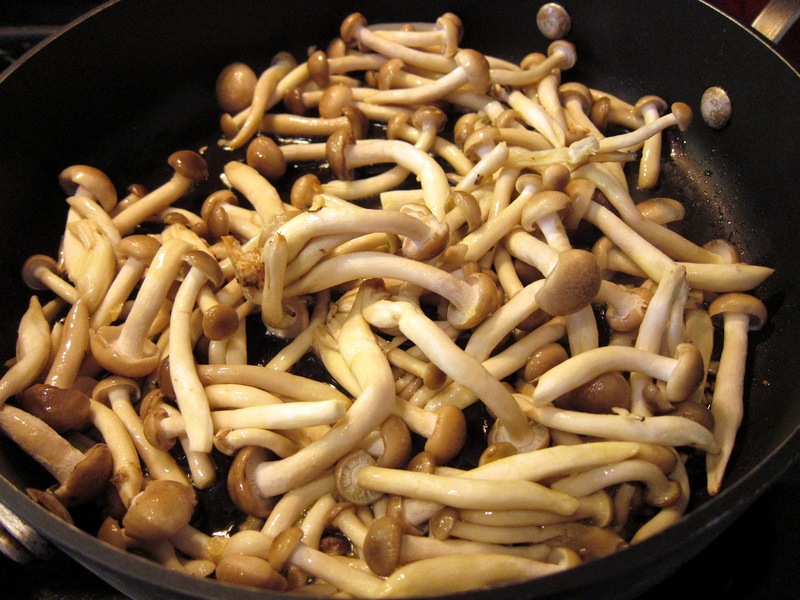 The other key ingredient here is miso paste which works very nicely with the shimeji mushrooms. 1. Bring a large saucepan of water to a boil and cook the noodles according to package instructions. Meanwhile, heat the oil in a skillet over a low heat and add the garlic cloves. Saute until fragrant, about 30 seconds. 2. Turn up the heat and add the shimeji mushrooms and saute until the mushrooms are soft. Lower the heat and add a ladleful of cooking water from the noodles, the soy sauce, and the miso paste. Stir until the miso is dissolved well. Adjust seasoning with salt and pepper and seave the sauce to simmer. 3. Drain the noodles and add them to the sauce. Stir well to coat every noodle and serve with chopped onions. You don’t have to add green onions, that’s just something that I usually have in the fridge. Triple T added some asparagus and she said it was pretty good. She was put off by the amount of oil (originally 1/2 cup) so cut it down significantly. I would say 1/4-1/3 cup is good. 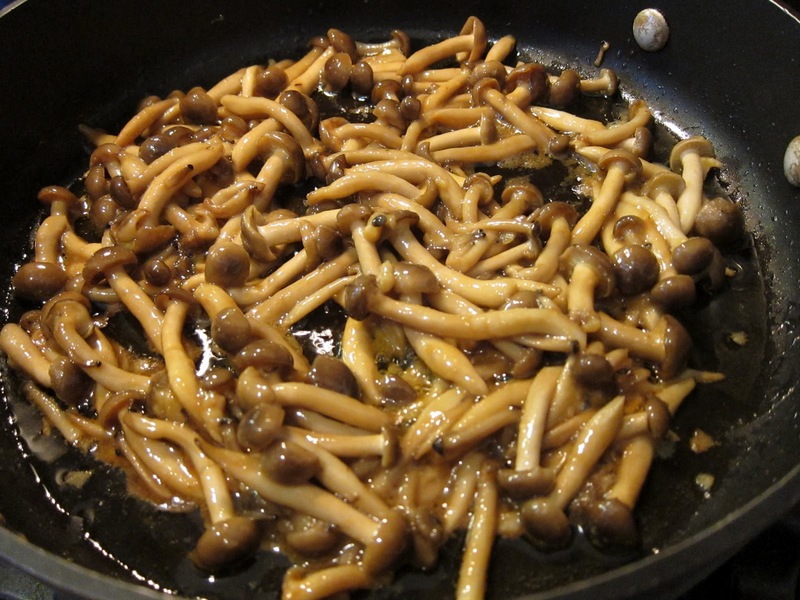 I tried substituting the shimeji mushrooms for criminis and it just didn’t taste the same so I wouldn’t recommend it. I also tried using rotini pasta but it just didn’t have the same texture with the sauce. The original recipe calls for “Japanese noodles.” I’m not sure what that actually means, but linguine has always worked out for me. I make this at least every 1-2 weeks and I’ll eat it all by myself since Dumpling Man isn’t as enamored by it as I am. That’s saying a lot since most of my dishes are on a 3-4 week rotation and I’m a huge carnivore. I was thinking of trying to add clams, maybe some sake to make a play on the Italian dish, linguines with clams. So maybe next time, but it’s pretty good as it is. Anyways, try this one out and see for yourself!